If you are thinking of purchasing a property on Mallorca, then you should make sure that you are well informed about the specifics. Lutz Minkner has provided the following Information to help you. Unlike in German law, the contract of sale need not be in the written form nor notarised. However, notarial certification is a pre-requisite for the property to be included in the land register. The land register entry is essential for the purchaser, otherwise he does not acquire a consolidated legal position. For example, the new owner would be defenseless against the risk of the previously registered owner selling the property to a third party. For this reason, every property purchase in Spain must be notarised – regardless of whether it is a villa, apartment or finca. Although the parties could in fact go to the notary immediately, in practice, for one reason or another, other contracts will come into play in advance of the notary contract (Escritura de compraventa). If the prospective customer has found his dream home, there are still plenty of questions to be answered: An architect or a surveyor should look at the property, financing needs to be negotiated with the bank, the tax consultant or lawyer must clarify the contract, and the seller has to put together various documents pertinent to the property. This means that several weeks may pass before the signing of the notarial contract, however, the parties want to commit themselves provisionally or definitively in advance. The most common form of contract for this purpose is the reservation contract, the option contract and the private contract of sale, which we explain in detail below. The reservation contract: If the buyer has merely an increased interest in buying, the reservation contract comes into consideration. This contract allows the seller and the prospective buyer to come to an agreement whereby the seller will ‘reserve’ the property in question for several days and apply a low reservation fee. If the interested party decides to purchase within the deadline, the reservation fee will usually be counted towards the option fee or the purchase price. If he decides against a purchase, the reservation fee is generally lost. The option contract: A much more binding contract is the option contract. In this case, the seller (option provider) generally grants the buyer (option holder), upon payment of an option fee, the right to acquire the property within an option period at a certain purchase price. The seller may not sell to a third party within this period. As a rule, the option fee is 10% of the purchase price, which, in the case of a purchase, is deducted from the purchase price and otherwise remains with the seller. If the buyer exercises his option right and the seller cannot fulfill his obligation to sell the property, for example he has sold the property to a third party for a higher price, it is usually agreed that the seller has to pay back the option fee and an additional payment to the same amount as a lump-sum compensation. Whether or not the buyer has the right to fulfill the contract depends on the wording of the option contract. The private purchase contract: Upon conclusion of a private purchase contract, the property is legally sold. This type of contract is often used when the parties want to seal the purchase immediately and have the intention to specify a lower purchase price in the notarised contract for tax savings. In this contract, the true purchase price is entered. Although this practice is common, it is still illegal. The notarial contract of sale: The notarial contract of sale, commonly called “escritura”, is as mentioned, a pre-requisite for the new owner to be entered in the land register. In addition to the personal data of the parties involved, the notarial deed essentially contains the exact description of the property with any existing charges, the purchase price and the terms of payment. The Spanish notary has a limited list of obligations in the preparation of land purchase contracts. He must satisfy himself of the identity of the parties and, on the basis of a previously requested excerpt from the land register, check whether the information provided by the parties coincides with the data of the property register. He will ensure that the final receipt of the local council tax, the certificate of habitability, the energy certificate and, in the case of the sale of a property in a property with communal facilities, is accompanied by the attestation of the administrator and the president that payment of the community fees is up to date. At the latest i.e. within 24 hours after signing the notarial deed, the notary has to inform the land registry of the authenticated document. The Spanish property register, the land register: at the same time of the notification of the sale by the notary, a priority notice is entered in the land register, which blocks another entry for 10 days. If the buyer submits the sales deed to the land registry within this period, the priority notice will be extended by another 60 working days. After the real estate transfer tax has been paid to the tax office, registration of the new owner in the land registry office can take place. In inheritance and marriage disputes as well as in foreclosure and bankrupt proceedings, we are increasingly asked for assistance with information from the property or commercial register. We have therefore decided to include the collection of such information in our service programme. We can guarantee the transmission of the requested extract within 24 hours. We charge the following fees for this: 1. Extract from the property register, lump sum € 100.00 plus 21% IVA, 2. Extract from the commercial register, flat rate €100.00 plus 21% IVA. 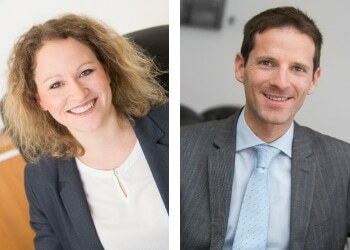 There are several types of pre-contractual commitments that Kinga Vereb and Pieregidio Rebaudo will gladly discuss with you. Incidentally, if you have your own lawyers or tax advisors, they will prepare the documents needed for the notary’s appointment in cooperation with them, so that there are no surprises and ambiguities at the notary’s appointment. The legal department of Minkner & Partner exclusively manages the purchase contracts for properties represented by them. For general legal advice and specific legal disputes, we are able to refer you to law firms from our network, that we can highly recommend due to years, even decades of cooperation.